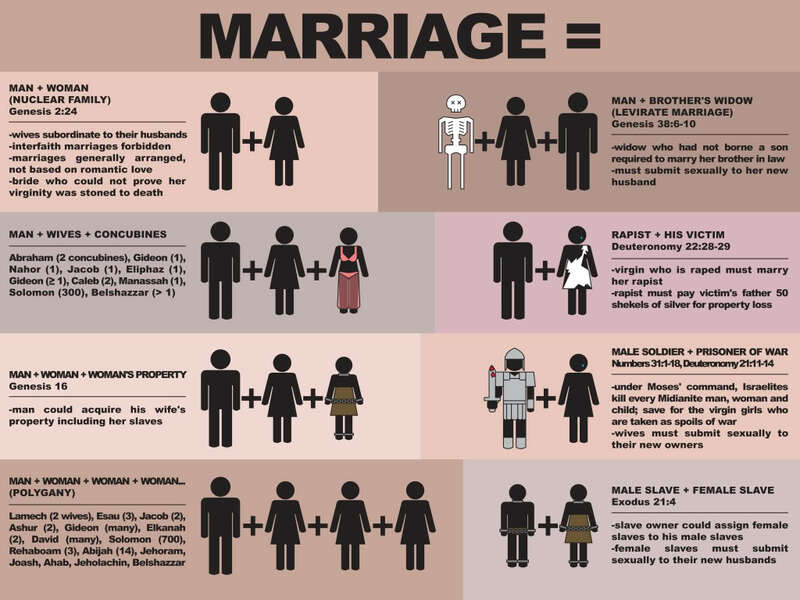 “the biblical definition of the family unit” In which children are the property of their fathers and women are the property of their husbands? In which children can be put to death at the leisure of their fathers? I say again, the Bible is not just factually incorrect, but also morally reprehensible. They can easily be explained. Cuz God. Correction: Cannot be explained away without appeals to an imagined malefactor. Are you trolling? Please say you’re trolling. What is it about Chick-Fil-A’s alleged “moral compass” that you think is admirable? What are the things that society pressures you to allow and tolerate that you think you should not? When group #1 boycotts group #2 for what group #1 perceives as “intolerence,” then group #1 has defeated it’s purpose and advocated exclusion rather than inclusion. It’s hypocrisy, it’s illogical. You make a nice, bias, emotionally-loaded, connotative-laced argument…but what you fail to consider is that perhaps it’s OK in America for people to have different beliefs. Simply because one doesn’t support “gay marriage” doesn’t mean their homophobic, anti-gay, or anything of the sort. 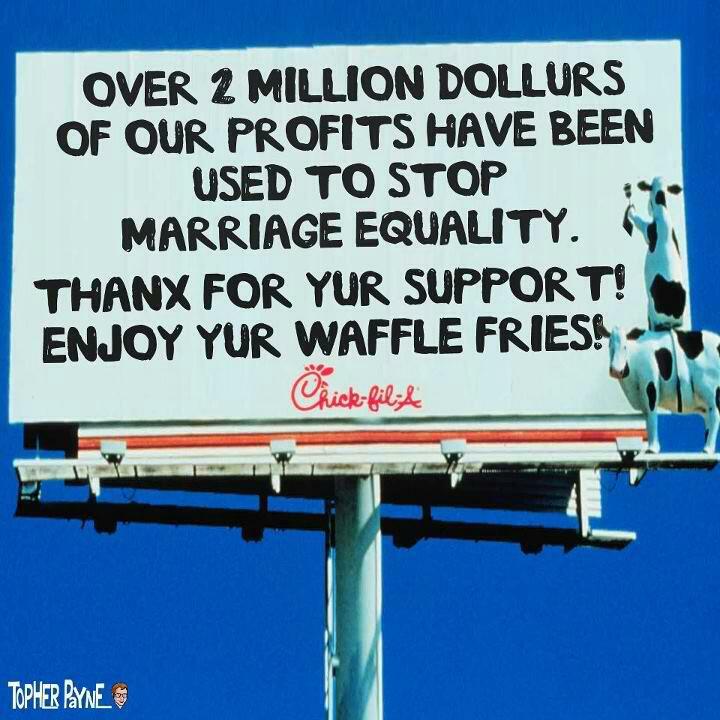 I personally don’t care who get married to whom…but I also stand for Mr. Cathy’s rights to believe what he wants…when we begin to take away free speech…and begin to espouse “thought crimes” we are on a very slippery slope…who’s right to speak and think goes next? First of all, what you just said makes no sense. Second, all opinions are not equal. If my opinion is “Everyone should have the right to marry who they want” and your opinion is “Only the people I approve of should have the right to marry,” those opinions are not equivalent. Because your opinion denies freedom to other people, whereas mine extends freedom to other people. There is no equivalency between these views. So yes, it is absolutely possible for me to say that your view is wrong without any hypocrisy whatsoever. but what you fail to consider is that perhaps it’s OK in America for people to have different beliefs. Again, nice condescension there. I agree that it’s OK in America for people to have different beliefs. It’s legal to hate gay people. It’s not legal–or, shouldn’t be–to deny them their own legal rights, though. Simply because one doesn’t support “gay marriage” doesn’t mean their homophobic, anti-gay, or anything of the sort. when we begin to take away free speech…and begin to espouse “thought crimes” we are on a very slippery slope…who’s right to speak and think goes next? Oh, this again. Please tell me who is taking away your free speech. Please tell me who is controlling your thoughts. Name the House or Senate bill that is doing that. Because, guess what. The first amendment only applies to the government. I absolutely don’t care what you think. As in, I don’t care what your thoughts are about gay people. I only care what you do with those thoughts. If what you do with those thoughts is deny gay people the rights they deserve, then what you are doing is not “free speech.” It is, well, denying people their rights. I disagree. The problem is not exclusion, discrimination, or intolerance taken pure, but rather the way in which those things are being applied. Miriam, myself, and the rest of those in the “boycott Chick-Fil-A” camp are opposed to the exclusion, discrimination, and intolerance of LGBTQ persons, because we see no reason to be discriminatory, exclusionary, or intolerant towards LGBTQ persons, and we (at least some of us) are concerned about the implications of Cathy’s statements, that being that superstition, from a source that encourages brutal violence in response to alleged “offenses” that we find just as harmless and innocuous as being queer, takes precedence in Cathy’s mind, and, based on his statements and the activity of the company’s philanthropic arm, in the upper management of Chick-Fil-A over the mental, emotional, financial, and, in extreme cases, physical well-being of fellow citizens. Attempting to quarantine and blockade the sources of corrosive and toxic social stances is not the ethical equivalent of proclaiming, and working toward the codification of, those same corrosive and toxic social stances.